Updated Wednesday March 21, 2018 by Denny Moton. 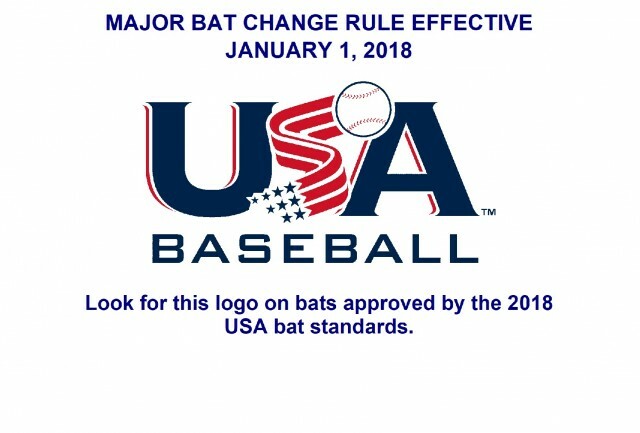 Bat Standard - Effective January 1, 2018, all bats must meet new performance standards established by USA Baseball, the national governing body of amateur baseball in the United States. The bat must not exceed 2 5/8”inches in diameter and must be stamped with the USA Baseball Logo. All bats stamped “BPF 1.15” will not be legal for play in all age divisions beginning January 1, 2018. A complete listing of approved bats is available at usabat.com. Tee Ball Bat Exception – Old tee ball bats 26” or less, manufactured prior to new USA baseball standard may be used.